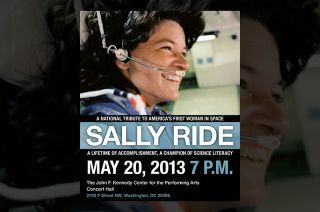 The national tribute, "Sally Ride: A Lifetime of Accomplishment, A Champion of Science Literacy," will be held at the Kennedy Center for Performing Arts in Washington, D.C. on May 20, 2013. NASA will join journalist Maria Shriver, tennis legend Billie Jean King and Grammy-award winning vocalist Patti Austin in remembering the life of Sally Ride, the United States' first woman in space, at a tribute in the nation's capital this month. The special evening event, entitled "Sally Ride: A Lifetime of Accomplishment, A Champion of Science Literacy" will be held Monday, May 20, at the John F. Kennedy Center for the Performing Arts in Washington, D.C. The event is open to the public, though there are limited tickets available. Sally Ride died on July 23, 2012 after being diagnosed with pancreatic cancer. She was 61. In addition to Shriver, King and Austin, the national tribute will also include the talents of Damian Kulash with the rock band OK Go, dancer and choreographer Twyla Tharp, and the youth performers from the Maryland Classic Youth Orchestra, the Centreville High School Choral Union from Virginia, and dancers from the University of North Carolina School for the Arts. The program for the evening event is still being organized and additional participants, including representatives from NASA, are expected to be announced. The 7 p.m. EDT (2300 GMT) event, which NASA describes as an "an educational tribute," is presented and sponsored by Sally Ride Science, the company the astronaut founded in 2001 to motivate girls and young women to pursue careers in science, math and technology. Members of the public wanting to attend the tribute need to complete a form on NASA's website by May 15. The free tickets, which are being distributed on a first-come, first-served basis, will be available to pickup from NASA's will call tables at the Kennedy Center on the day of the event. NASA earlier memorialized Ride by naming the intentional lunar crash site for its twin "Ebb" and "Flow" moon probes as the "Sally K. Ride Impact Site." Ride led the mission's MoonKAM student imagery program through her work with Sally Ride Science. The U.S. Navy also posthumously honored Ride with the christening of an auxiliary general oceanographic research ship. Set to join the fleet in 2015, the R/V Sally Ride will be the Navy's first academic research ship named after a woman. To request free tickets to the May 20 national tribute for Sally Ride, see NASA's Sally Ride Tribute website here.